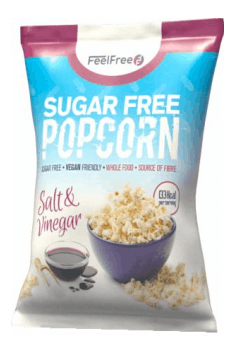 Feel Free Nutrition Sugar Free Popcorn is a delicious, low-calorie snack, prepared with the highest-quality ingredients. The product contains fiber and no added sugar – it allows you to almost completely assuage tiny hunger. Many people decide to change their lifestyle, starting with the correction of diet, however, abandoning old habits often fails due to a demotivating lack of visible results. The reason for this is very often sneaking high-calorie snacks, thus providing the body with a huge portion of energy. This, in a long-term run, may make it difficult to reduce excess body fat. For the sake of the individuals who cannot resist these small pleasures, the manufacturer offers more and more small delicacies. One of them is the Low-Calorie Popcorn, the package of which contains only slightly over 100 kcal! You can now count them into the calorie balance and enjoy the amazing taste without remorse. Many delicacies, not only those classified to sweets, have in their composition an addition of sugar or a glucose-fructose syrup. Not only are they flavor enhancers, but they pose unpleasant consequences for the health and body shape of consumers. Consumption of simple sugars is associated with insufficient stimulation of the satiety center, which results in further willingness to consume another dose of "small pleasure". In the long-term, this leads to, as already mentioned above, gaining excess body mass. Fortunately, no sugar or glucose-fructose syrup was placed in the popcorn, so as not to increase the energy value of the product and lead to fluctuations in the level of blood glucose. Hence, this popcorn can also be eaten by diabetics, whose task is to carefully monitor the value of their blood glucose. Besides, the addition of fiber will provide a feeling of fullness and will prevent further snacking until the next meal. Not only the addition of sugar is a ubiquitous problem on the food market. The problem is also en masse addition of flavor enhancers and preservatives, which are a huge dose of various chemical compounds that may pose a health risk. However, that is not the case with Feel Free Nutrition Popcorn. It contains natural aromas derived from dried vegetables, which give an amazing taste, that enfolds taste buds, as well as a color encouraging for consumption. Therefore, there is no risk that the frequent consumption of the snack may ever contribute to the development of diseases. It is also worth adding that the product does not contain any ingredient of animal origin, hence it is suitable for consumption by vegans. In conclusion, Feel Free Nutrition Low Calorie Popcorn is a delicious addition to the menu, which can be easily sneaked in between the main meals, without worrying about stunting the progression in body shaping. The product will work perfectly as a snack between meals – to reduce a tiny hunger. It can also be a great addition at a party with friends. Your guest will be surprised by your ingenuity. The delicacy should not be a substitute for a wholesome and varied diet. Smokey Barbecue: Butterfly Popcorn, Rice Flour, Tomato Flavour, Paprika, Salt, Onion, Smoked Paprika, Garlic, Smoke Flavouring, Colour: Paprika Extract E160c, Rapeseed Oil. Salt&Vinegar: Butterfly Popcorn, Sodium Diacetate E262ii, Corn Starch, Salt, Citric Acid: E330, Rapeseed Oil.